I have finally finished my exams, but the stress-eating and freedom-drinking has left my purse a little lighter than I would like, meaning no shopping allowed. So instead of going shopping and buying new outfits, I’m just going to put together a little wishlist of things I’ve been keeping my eyes on (and will hopefully purchase…eventually).These dip-dye shorts from vintage store 9 Crow Street are incredible! 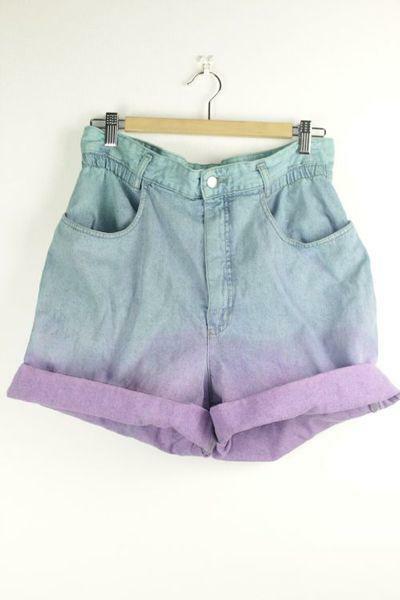 I love oversized shorts, and dip-dye is something everybody loves at the moment and channels summer so well! These shorts would look great at any festival this summer (I’m going to Southside in Germany) and I would pair them with some willies (for the muddier festivals) or biker boots, a crop top and a parka! Nasty Gal are another store I’ve only recently come across and I am literally addicted! I spend hours and hours browsing and my wishlist includes pretty much every item they have! However, as I’m graduating in just over a month (ohh my), I’ve been on the lookout for the perfect graduation dress and these two from Nasty Gal caught my eye! The black moto dress is incredible! The tough corset and caged back really toughens it up and takes it to the next level of LBD. It wouldn’t look too crazy under my graduation gown, but once I took that off, it would be incredible! I would either pair it with Jeffrey Campbell Litas or Foxy Wood. Another dress that I have my eye on is this ‘Tribal Tail’ dress. I must have an obsession with the backs of dresses, as the cool tribal-print straps on this caught my eye straight away, again, taking it from a pretty dress to something original and cool. As oppose to Nasty Gal, Urban Outfitters is somewhere I’ve shopped for years,and their stuff continues to be at the top of all my wishlists. 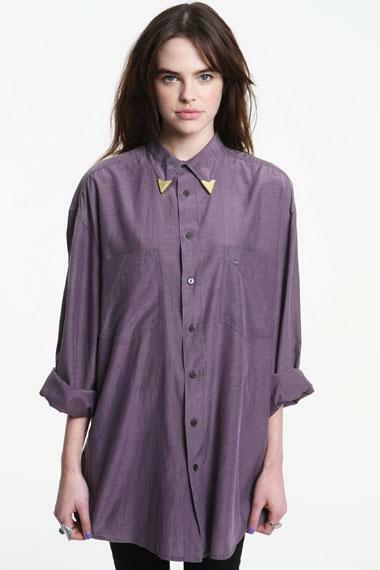 This ‘Vintage Renewal Lilac Tipped Collar Shirt’ is something I’ve been watching for a while and I absolutely love it! Oversized shirts are my favorite items of clothing and this one is so great! The silk material and silver-tipped collar just adds to the uniqueness and stops it looking too masculine (which can be a problem with shirts like this) and the color is really great! Paired with high-waisted shorts and knotted up or just with leggings and boots, this shirt is a must! 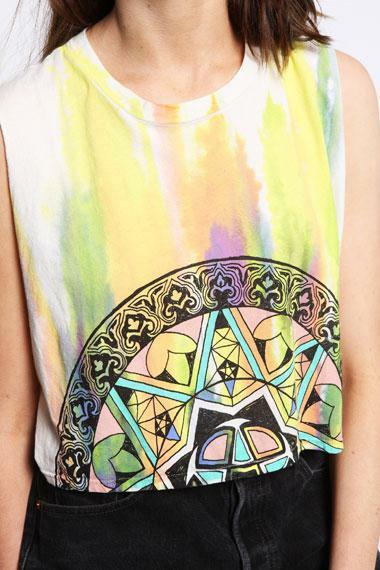 I’ve also been thinking a lot about my festival outfits, and this ‘Moroccan Paint Tee’ caught my eye. Its cropped, boxy style and bright colours make for a really cool and easy to wear festival tee, and with some high-waisted shorts, Hunter wellies and an oversized vintage denim shirt, this would look great! 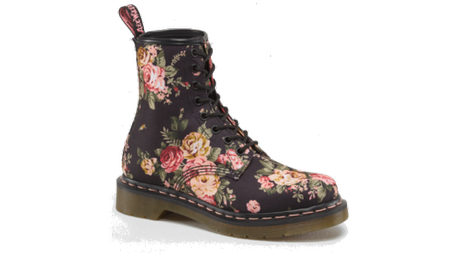 Last but not least, something that’s been on my wishlist for a couple of years now: Dr Martens! Absolutely classic boots that have gone from strength to strength since their opening in the 1960s, these never fail in the style stakes. The pair I have my eye on are these black Victorian flower prints which have taken the classic 1460 style and launched them into the 21st Century. These print boots would look great with anything and if/when I get them, I probably will wear them with everything!